By BEN WORTHEN: Falling milk prices and rising production costs have family dairies like the one run by the Lafranchi family in Marin County in a bind. So last year, the Lafranchis tried a new tactic: They began selling cheese they make by hand from some of their milk. "As a family, our choices were pretty clear: continue in the dairy business and continue to struggle, or take a step forward and reposition ourselves for the future," said Rick Lafranchi, a third-generation farmer. Today, the family's Nicasio Valley Cheese Co. makes six varieties of cheese that it sells in more than 40 Bay Area stores. A growing appetite for artisan foods is making moves like the Lafranchi family's increasingly common. 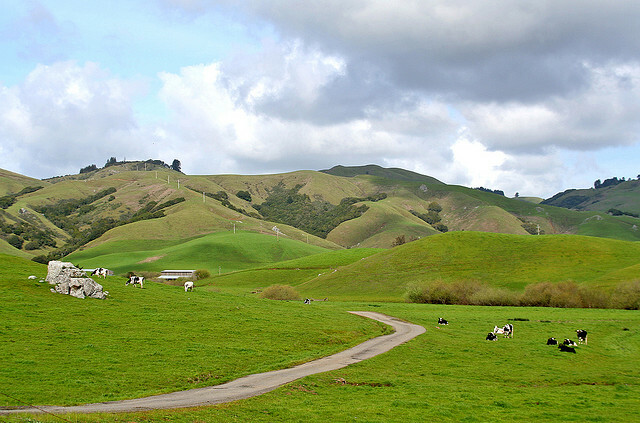 Of the 22 artisan cheese producers in Marin and Sonoma counties in 2010, 10 were dairy farms that use their own milk, according to a report by the University of California Cooperative Extension. Four more artisan cheese producers are in the process of starting up, even as four dairies in the two counties went out of business last year, the report said. These 22 producers in total made almost eight million pounds of cheese last year, covering 95 varieties, which sold at retail for as much as $30 a pound, according to the report. The price of fluid milk in Northern California, on the other hand, reached a 15-year low of $11.13 per 100 pounds in 2009, less than half the price in early 2008, according to the state's Department of Food and Agriculture. Though milk prices more recently have topped $20 per 100 pounds, they have fluctuated wildly, and prices of fuel and feed have continued to climb. Artisan cheese is produced primarily by hand in small batches, whereas mass-produced cheese is typically made by machines in larger quantities. Nationwide, sales of specialty cheese, a broader category than handmade artisan cheese, hit $3.23 billion in 2010, up 6.1% from 2008, according to the National Association for the Specialty Food Trade. The group estimates that artisan cheeses represent about 20% of the total and are growing at a slightly faster rate. "We're where wine was 30 years ago," said Ellie Rilla, a University of California farm adviser based in Novato. "It doesn't look like there's any chance of a bubble popping in the foreseeable future." Turning to artisan cheese isn't a cure-all, however. The equipment needed to produce cheese can be expensive and cheese takes time to make and age. Forecasting demand can be tricky, especially when a cheese is made months before it is sold. Most important, the product has to taste good. "Artisan cheese is a tough business," said Beau Schoch, who in 2009 began selling an aged Monterey Jack and a Dutch-style edam made at his family's dairy in Salinas. Still, with the 100-cow dairy losing money at the time, the risks of making cheese were worth taking to help preserve his family's 67-year-old farm, he said. Two or three times a week, Mr. Schoch pours milk into a 120-gallon vat where it is heated. The resulting cheeses are hand turned and washed each week with a brine solution. Mr. Schoch sells them at farmers markets for $15 to $25 a pound and at some retail stores. The cheese part of his business is profitable but would just break even if Mr. Schoch paid himself a salary. He works full-time for the U.S. Department of Agriculture and makes cheese on the side. Some farms that turned to artisan cheese are trying to diversify further. Point Reyes Farmstead Cheese Co. in Point Reyes, which began making blue cheese 11 years ago to keep the family farm going, now is trying to make the farm a tourist destination. It recently built a culinary center where it gives tours, teaches cheese-making classes and hosts events. "It's not just about turning milk into cheese and having more margin," said Jill Giacomini Basch, a managing partner. She declined to disclose the company's revenue but said it was profitable. Artisan cheese makers say moves like the one by Point Reyes Farmstead Cheese are the next step for their industry, similar to the way wineries offer tastings. The Marin Economic Forum recently unveiled a "cheese trail" map so tourists can plan visits to the area's artisan cheese makers. In Nicasio in Marin, Mr. Lafranchi had been talking about making cheese on his dairy for years and studying it in earnest since 2005. Fearing that the dairy would lose money if it continued selling just milk, he took the plunge in 2009, when he converted an old dairy on the property into a creamery and brought over a cheese maker from Switzerland to teach his brother Scott, who became the primary cheese maker. Last year, he started selling cheeses like Nicasio Square, which is similar to a telaggio, to local markets and within three months had a distributor. The cheese company is using up only about 10% of the milk from the family's dairy now, but Mr. Lafranchi anticipates that growing. The business is almost profitable and will be as it ramps up production, he added. The cheese business is going to have "double-digit growth for years to come," he said. "We didn't want to be the generation that shut down the dairy."